Abstract: Materials used in energy conversion and storage devices are often subjected to multi-field driving forces (electrical, chemical, radiological, thermal, mechanical, etc.). In predicting the deformation and failure of these materials, conventional mechanics of material theories are no longer adequate, because these multi- field driving forces are typically coupled and produce synergetic effects that are not predicted by the classical theories. To fully understand how the different driving forces interact requires theories and models that are capable of accounting for the coupling of multi-field interaction processes. In this talk, a theory for the mechanics of solids will be presented that accounts for the coupled effects of mechanical, electrical and chemical driving forces. The presentation will begin with an introduction of the general framework of the electro-chemo-mechanics, followed by examples of its applications to solid oxide fuel cells and Li-ion batteries. Finally, path-independent integrals in electro-chemo-mechanics will be discussed. Biographical Sketch: Jianmin Qu is Karol Family Professor and Dean of School of Engineering at Tufts University, where he holds an appointment in the department of Mechanical Engineering. Dr. Qu received his Ph.D. and Master’s degrees from Northwestern University in theoretical and applied mechanics. Prior to joining Tufts, Dr. Qu was a Walter P. Murphy Professor in the McCormick School of Engineering and Applied Science at Northwestern University from 2009 to 2015. 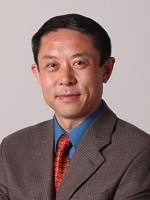 Before returning to his alma mater in 2009, Dr. Qu was on the faculty of the School of Mechanical Engineering at the Georgia Institute of Technology from 1989 to 2009. Professor Qu’s research focuses on several areas of theoretical and applied mechanics including micromechanics of composites, interfacial fracture and adhesion, fatigue and creep damage in solder alloys, thermomechanical reliability of microelectronic packaging, defects and transport in solids with applications to solid oxide fuel cells and batteries, and ultrasonic nondestructive evaluation of advanced engineering materials. He has authored/co-authored two books, 12 book chapters and over 200 referred journal papers in these areas. For additional information, please contact Prof. Ying Li at (860)486-7110, yingli@engr.uconn.edu or Laurie Hockla at (860)486-2189, hockla@engr.uconn.edu.